A hot topic on the benchmarking scene has developed in the form of a HWBOT forum poll created by BenchZowner to discuss whether or not to continue to allow Engineering Sample CPUs as boint scoring hardware. For those that may not know, an ES chip is one that is not released to the public, cannot be sold (legally), and can be coveted for its potential overclocking performance over retail chips. 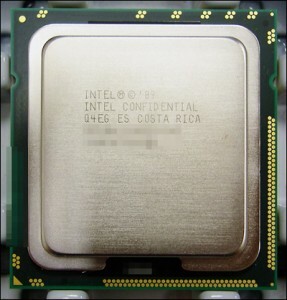 A lot of the sponsored overclockers use these chips and can potentially score more boints than an average joe that is using an unbinned retail chip, which is essentially the heart of the matter. The results for this poll seem to be a mixed bag and the debate has been at a constant boil here at overclockers.com and at HWBOT.org. In response to BenchZowner’s topic, another well respected bencher from our community, MIAHALLEN started another forum poll in regards to making an amateur and professional class separation at “the bot”. In the first 24 hours of voting, the result is considerably in favor (~2 out of 3) of making this change and the management at HWBOT have already been in discussion about it as well. So what does that mean to you and I, the average overclocker? Only time will tell, but I see this shaking down in two ways. The first, and not likely according to Massman, is that in the future, ES CPUs will not be accepted at HWBOT.org for boints. Many others have mentioned that this is not a solution as the binning process will just be done with retail chips or possibly even fudging CPUz to show that its not an ES chip. The other option that has been in discussion at HWBOT, at least behind the scenes and is now in the public spotlight as noted above, is separating the benchers into amateur and professional sections. The results of this will be unknown as well until rules are decided upon and its rolled out to the public. Stay Tuned benchers! You only have half the story. The hwbot staff and others with access to the development/VIP lounge side at hwbot have been working toward the "professional" league and have discussed moving ES cpus out of the general overclockers league since at least July 2009. Get your facts straight guys. Wow, eazy killer. How was anyone not in the know supposed to find that information out? I poured through the entire two threads to gather this information. Maybe next time can I send stuff like this through you since you are in the know? Can you specifically point out what is false so we can correct it? Thanks. I've been over most of the hwbot thread and our other thread here, first I've heard about this. The article sums it up pretty well that removing ESes doesn't fix anything, however I think we are going to see a certain man come in here and try to convince us otherwise. Wow, eazy killer. How was anyone not in the know supposed to find that information out? I poured through the entire two threads to gather some of this information. Maybe next time can I send stuff like this through you since you are in the know? Do some real investigation if you're going to jump on the band wagon and publish articles about this...otherwise it should remian in forum discussions. Articles imply a certain amount of research/fact checking has been done... or credibility gets lost. What bandwagon? What are you talking about? Its a general piece about whats going on?!!?!?!! Please check my edits above, there were mentions of it in the article as I quoted. I read both threads and mentioned what you state I missed. I put them in orange in case you missed them when reading the article. Again, if the information is not correct, please, since you are in the know, let us know and they will be corrected. You should have asked massman or rb, they probably would have given you more facts/solid dates, perhaps even what is really planned for the next hwbot revision and when it may be rolled out...real news. Earthdog, that's a solid summary my friend. It really hits on all the key points in the forums thread. Thanks for letting us in on the "confidential" details. Unfortunately, many of us (Earthdog included) do not have access to that area of hwbot. So his report is based entirely on the thread over here and other public information. The source of his facts were cited, and he presents the opinions of others as their opinions, not as his own or those of the Overclockers.com website as a whole. It is my job as editor to make sure those guidelines are followed. They were followed and followed extremely well. Earthdog's synopsis really impressed me. Sounds like a good idea for a follow up article if you ask me. Whom did he interview at hwbot? I'm gonna make like a banana and leave this thread. Passion is generally a good thing, until the point where it makes you look like your perspective is all out of whack. Everyone will decide that for themselves tho - the messages you post is what they will judge by. This article is not factually inaccurate - it simply presents current events, and references the source for people to decide for themselves. There isn't even any subjective framing of what is good or bad - and both quotes the author selected are in support of the HWBOT team's approach to the topic. A lot of us have been big supporters of HWBOT, we all enjoy their platform, and this isn't a criticism piece - hell, it simply states what is going on and what it could mean for the future of competitive benchmarking rather than that information being buried in forums/development/VIP lounges. Few people appreciate sarcasm. Making suggestions is usually well received. That makes me and probably any reader ask why is this guy angry? To answer your question - he didn't interview anyone. It's an editorial, it's not classified as news. Its a presentation and perspective of what is going on, leaving it for everyone to decide on their own what they think about the issue, as well as giving them a heads up on likely developments down the road. Speaking as someone who does not have access to the restricted areas of HWBot, the article looks accurate to me. It nicely sums up 20+ pages of threads on multiple forums. Agree. That should have been done, and it would have improved the article, no doubt. But this was a very high level 'article' about the situation, thats all. glad you nominated yourself to do so. I expect to see your article by the end of the day. If you can shoot over some contact info for the guys at hwbot (via PM or email), we'd be glad to check it out. Our report was certainly not inaccurate, but of course there are angles we did not cover. One of my goals as editor is to not leave any stone unturned. So if you have contact info for those guys, we can have somebody write a follow-up article. It's a good suggestion, I was just put off by your initial methods of presenting it. Well, before you go to bed, can you at least do us the justice of correcting what facts I had wrong (4th time I asked this with no response...) or filling in the 'other half of the story' (that I quoted for you that WAS mentioned sans specifics)? Thats a fair suggestion and would make a great follow up article, but I feel the article as it stands is more impartial... Perspectives obtained directly from HWBOT staff would best be made separately to retain that impartiality. This article simply presents the issue. It doesn't take BenchZowner's side, it doesn't take HWBOT staff's side, it doesn't take ANYBODY's side... Earthdog wasn't in bed with anyone - just a community observer with a great short summary. By the way, I've been communicating via PM with RichB about pulling hwbot data into OC Forums... Sometimes he replies very quick, sometimes I have to follow up after a week. I know how it is being busy. Anyways, no PM's were sent, but with your suggestion you can be sure the invitation is presented if anyone from HWBOT would be interested in sharing their perspectives on the issue for a followup article.